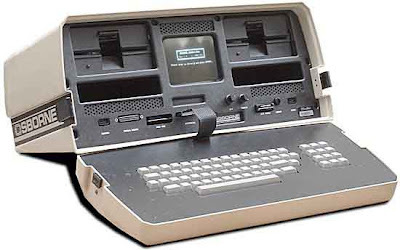 Although not called "laptop" at the time of its invention, the Osborne 1, pictured below, is considered to be the first working portable computer ever. It could be considered the first laptop – though it would have been very cumbersome to have this machine placed on your lap. But it did afford portability, which in those days was not even thought of. The computer cost $1,800 and weighed 24.5 pounds. It came with a five-inch screen, modem port, two 5 1/4 floppy drives and a large collection of bundled software programs. The computer ran the popular CP/M operating system and featured a full keyboard. It had an "optional battery pack" and thus did not have to be plugged into the 110VAC outlet for power. However, while the Osborne1 was a major breakthrough in computer technology and its portability, it did have its limitations, specially its small sized screen which could only display 52 characters per line of text. To compensate, one really had to scroll the screen display back and forth with the cursor keys to show lines of text up to 128 characters wide. The computer was designed by Adam Osborne from Thailand, who was a PhD from the University of Delware and had interests in computers and technical writing. In 1982, the Osborne Computer Company announced a successor, the Executive model OCC-2 with a larger screen and a cooling fan.